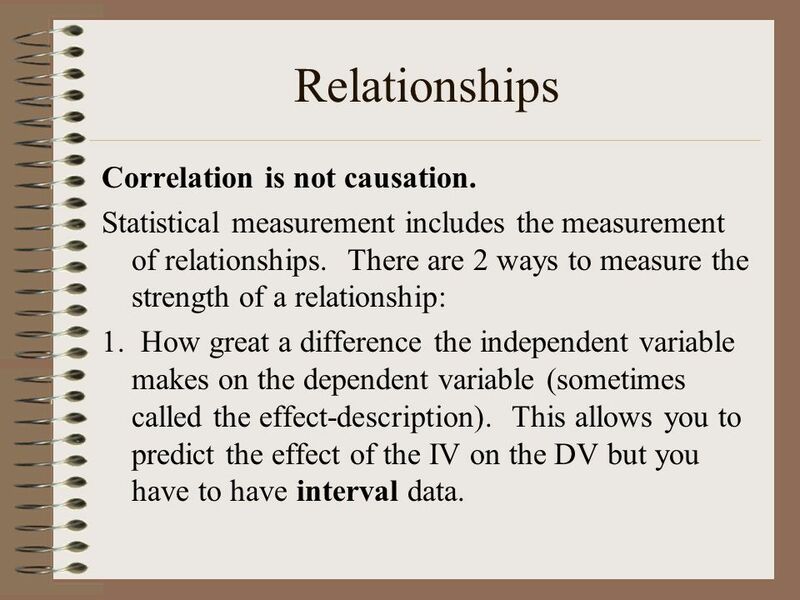 3 Relationships Correlation is not causation. 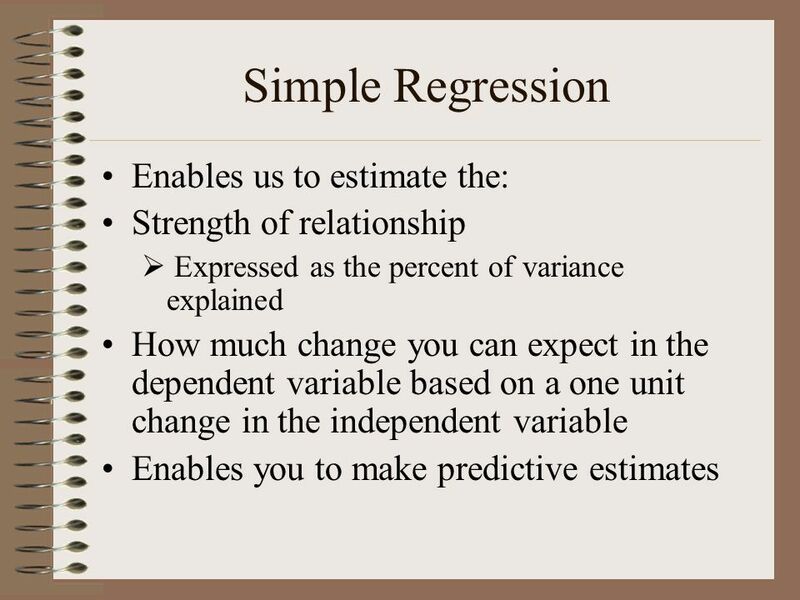 Statistical measurement includes the measurement of relationships. There are 2 ways to measure the strength of a relationship: 1. 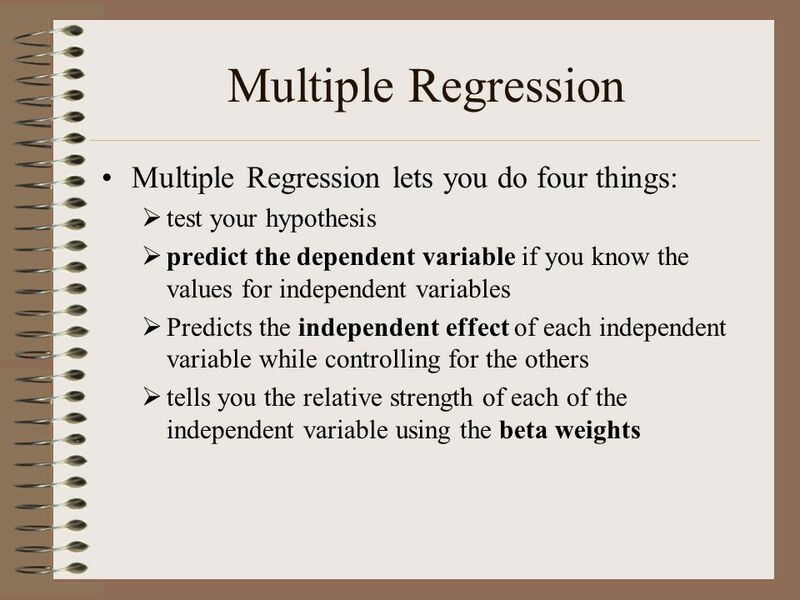 How great a difference the independent variable makes on the dependent variable (sometimes called the effect-description). This allows you to predict the effect of the IV on the DV but you have to have interval data. 4 Relationships 2. 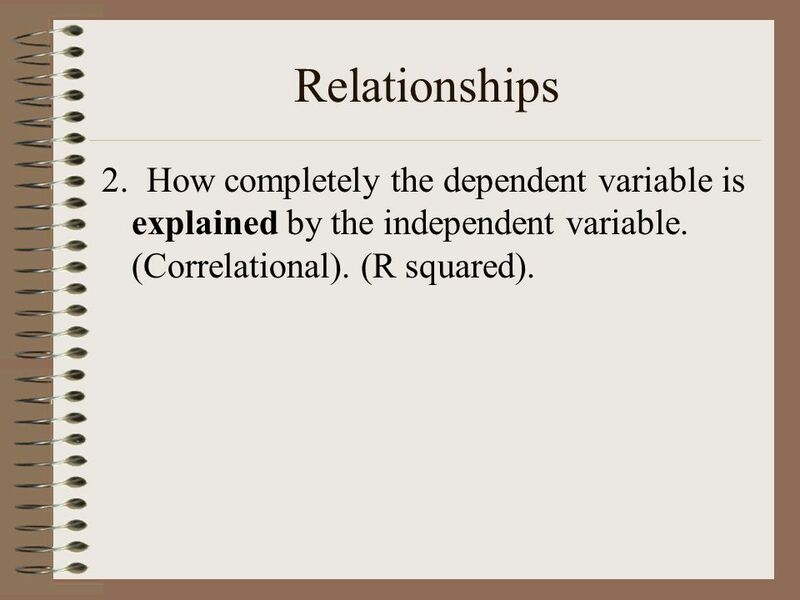 How completely the dependent variable is explained by the independent variable. 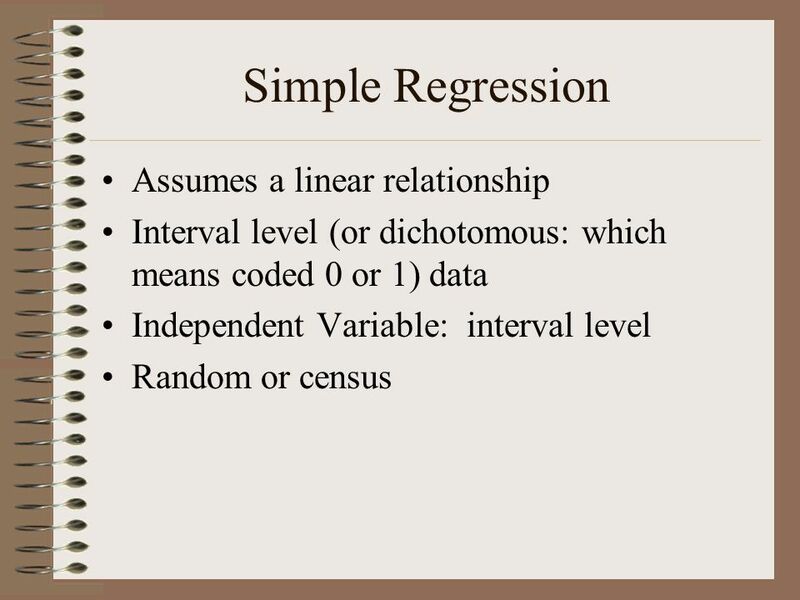 (Correlational). 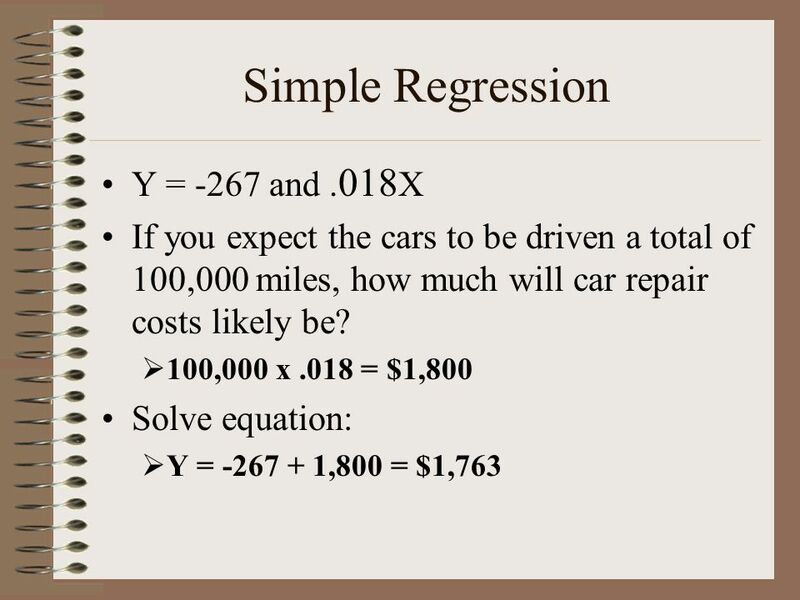 (R squared). 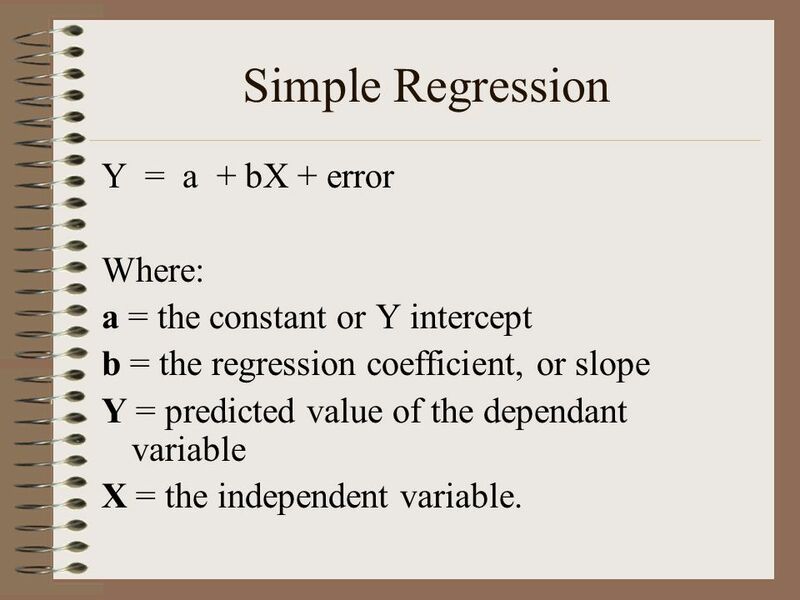 a = the constant or Y intercept b = the regression coefficient, or slope Y = predicted value of the dependant variable X = the independent variable. 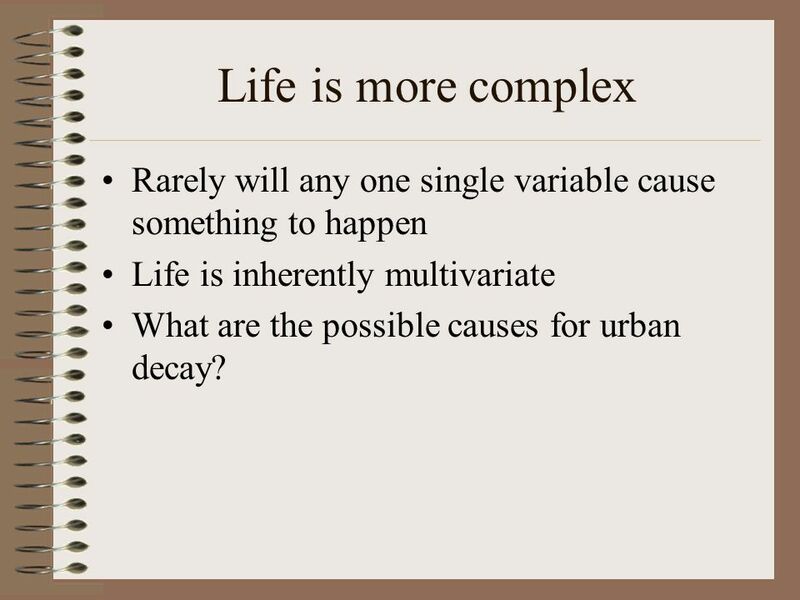 11 Life is more complex Rarely will any one single variable cause something to happen Life is inherently multivariate What are the possible causes for urban decay? 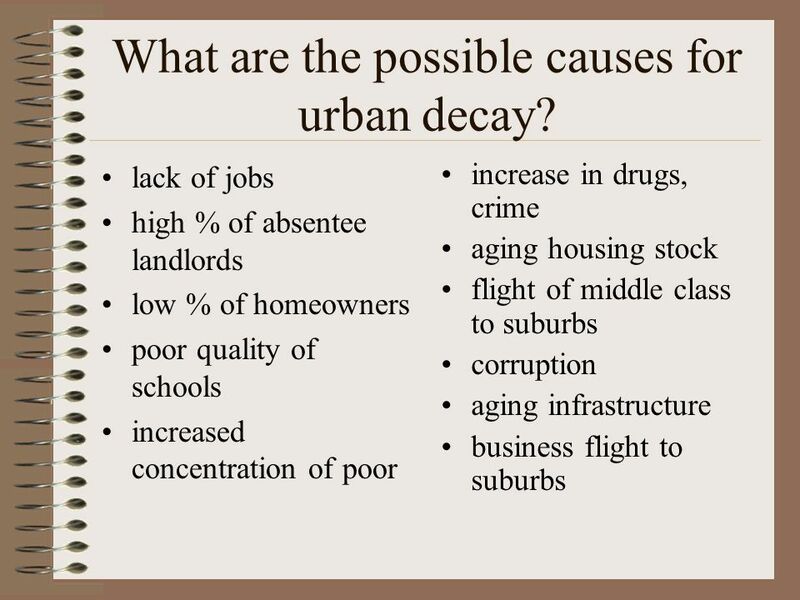 12 What are the possible causes for urban decay? 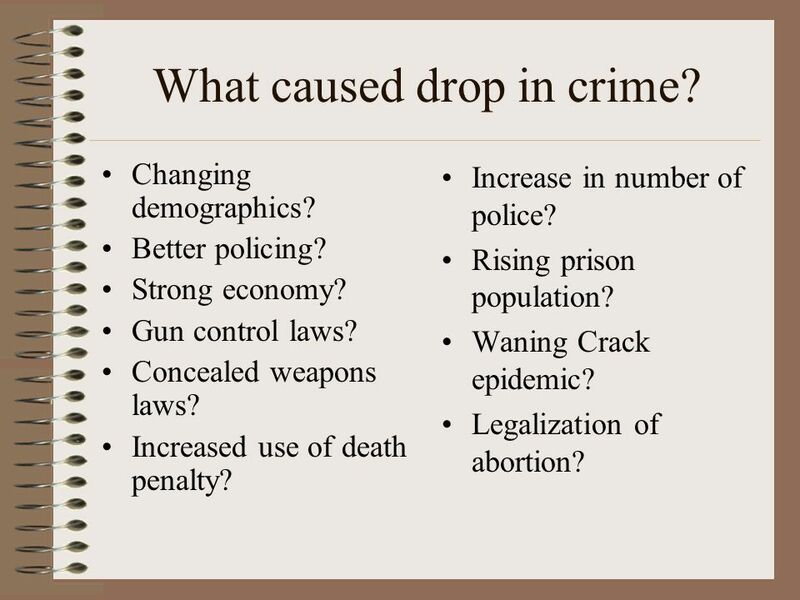 13 What caused drop in crime? Changing demographics? Better policing? Strong economy? Gun control laws? Concealed weapons laws? Increased use of death penalty? Increase in number of police? Rising prison population? Waning Crack epidemic? Legalization of abortion? 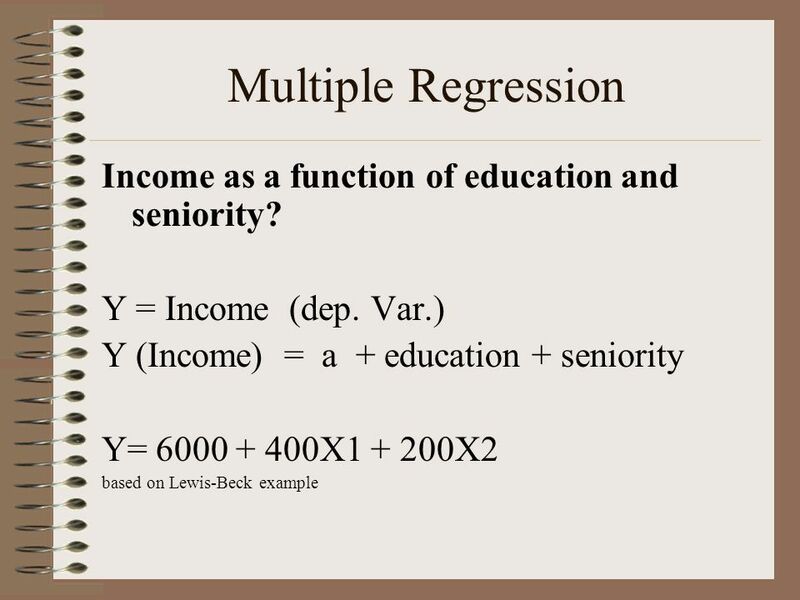 15 Multiple Regression Y = a1 + bX1 + bX2 + bX3 + b X4 + e.
16 Multiple Regression Income as a function of education and seniority? 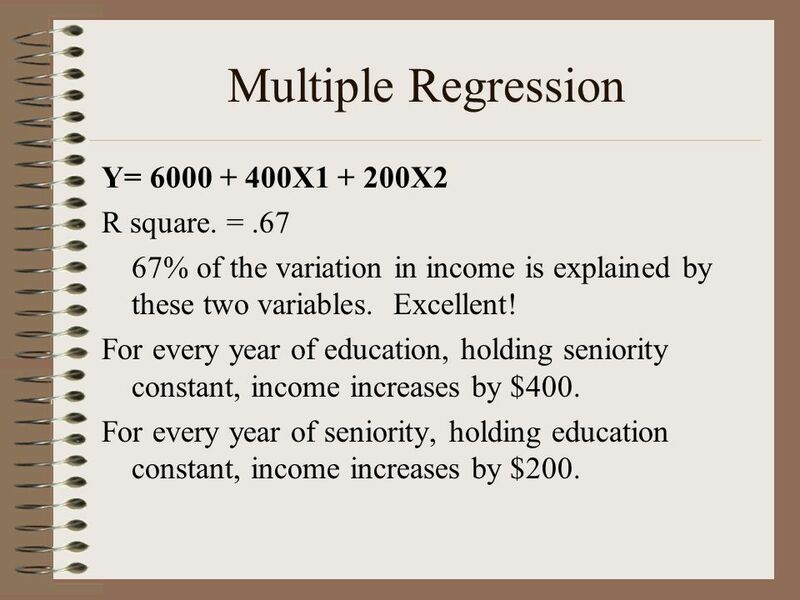 67% of the variation in income is explained by these two variables. Excellent! For every year of education, holding seniority constant, income increases by $400. For every year of seniority, holding education constant, income increases by $200. 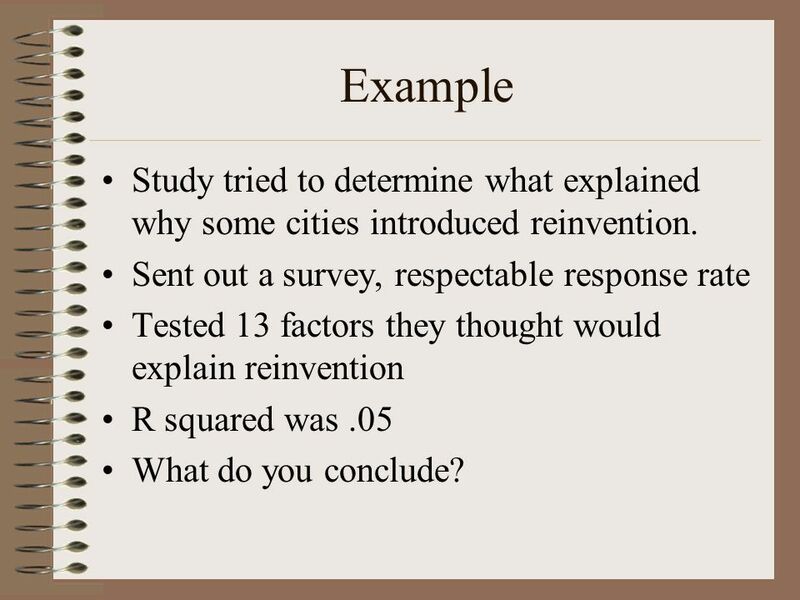 24 Example Study tried to determine what explained why some cities introduced reinvention. Sent out a survey, respectable response rate Tested 13 factors they thought would explain reinvention R squared was .05 What do you conclude? 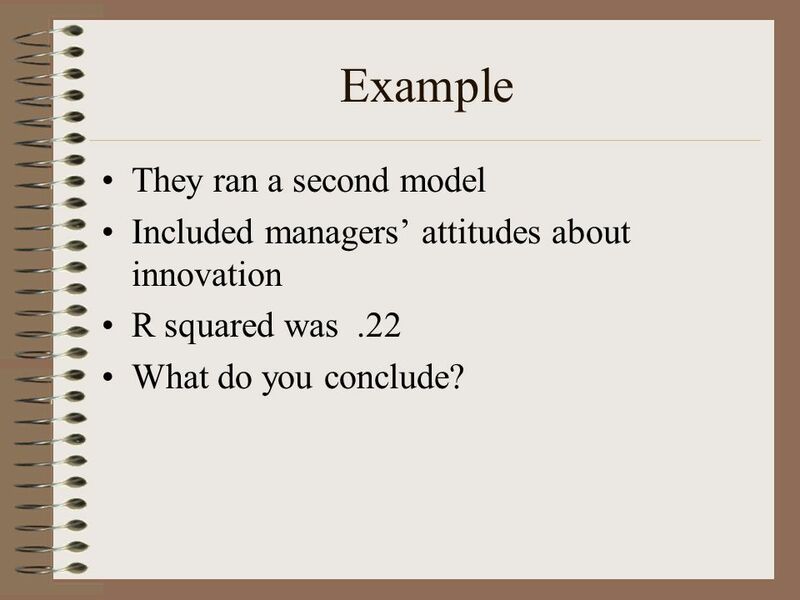 Included managers’ attitudes about innovation R squared was .22 What do you conclude? 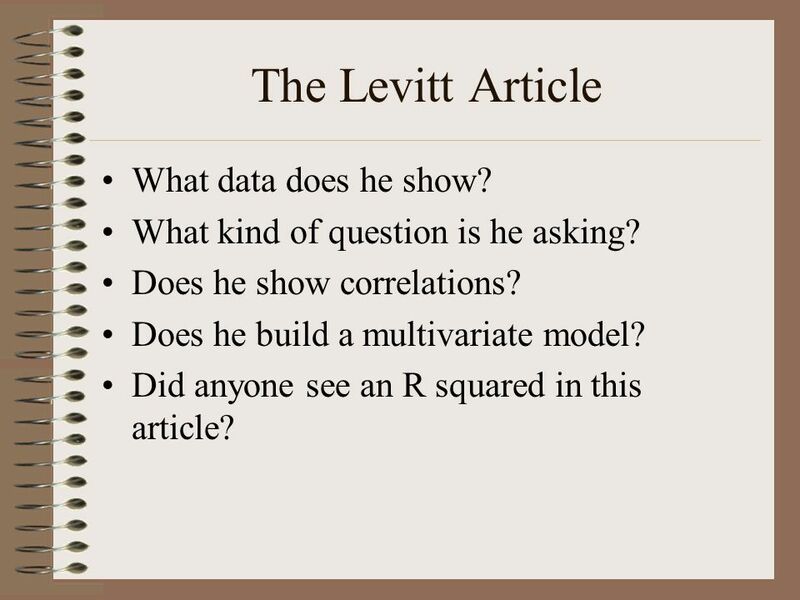 26 The Levitt Article What data does he show? What kind of question is he asking? Does he show correlations? Does he build a multivariate model? Did anyone see an R squared in this article? 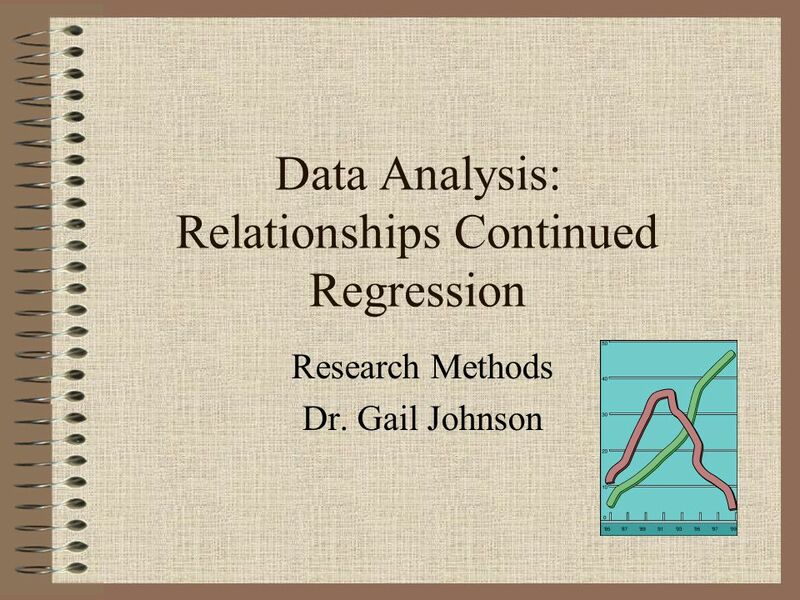 Download ppt "Data Analysis: Relationships Continued Regression"
Dr. G. Johnson, Data Analysis: Regression Research Methods for Public Administrators Dr. Gail Johnson. Regresi Linear Sederhana Pertemuan 01 Matakuliah: I0174 – Analisis Regresi Tahun: Ganjil 2007/2008. 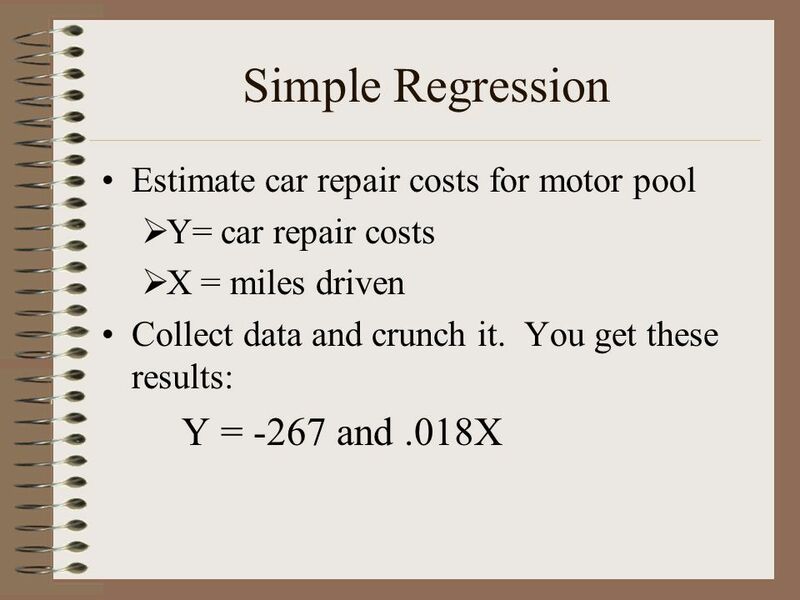 Regression Analysis Module 3. 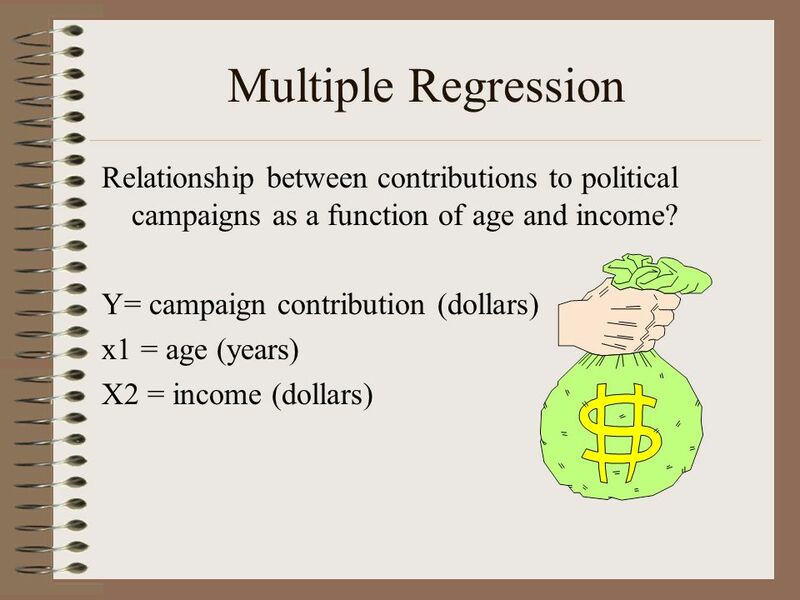 Regression Regression is the attempt to explain the variation in a dependent variable using the variation in independent. 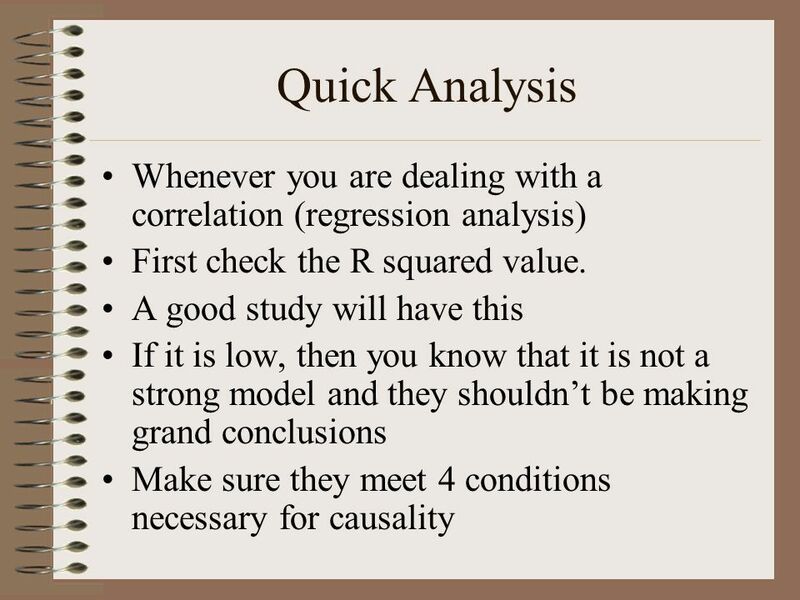 Soc 3306a: Path Analysis Using Multiple Regression and Path Analysis to Model Causality. 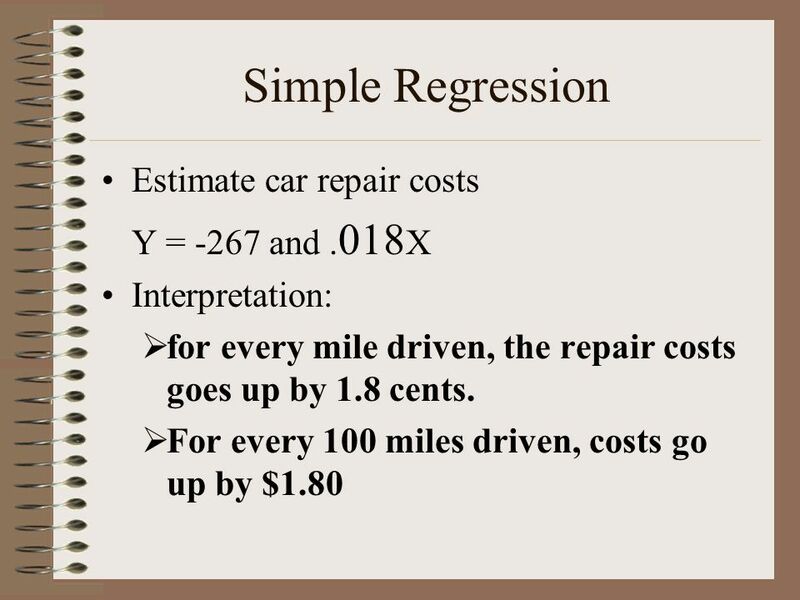 1 Simple Linear Regression and Correlation The Model Estimating the Coefficients EXAMPLE 1: USED CAR SALES Assessing the model –T-tests –R-square. 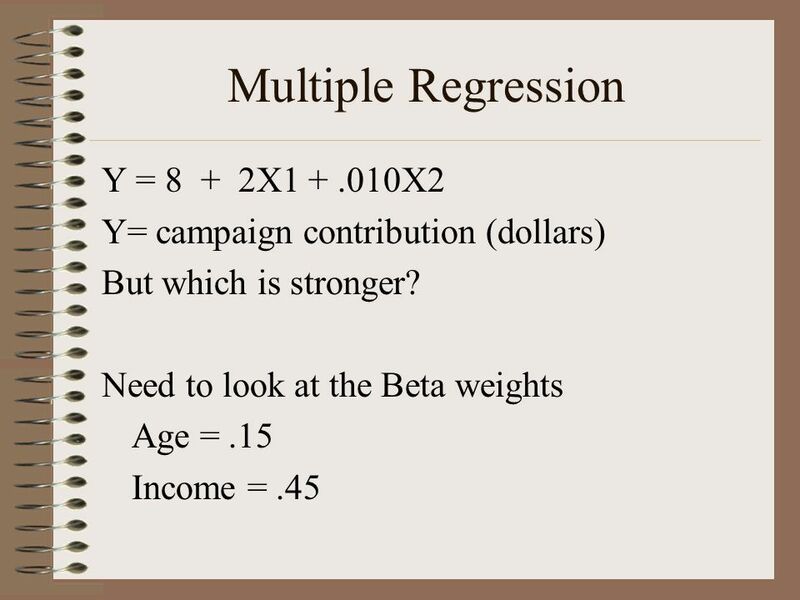 © 2000 Prentice-Hall, Inc. Chap Multiple Regression Models. 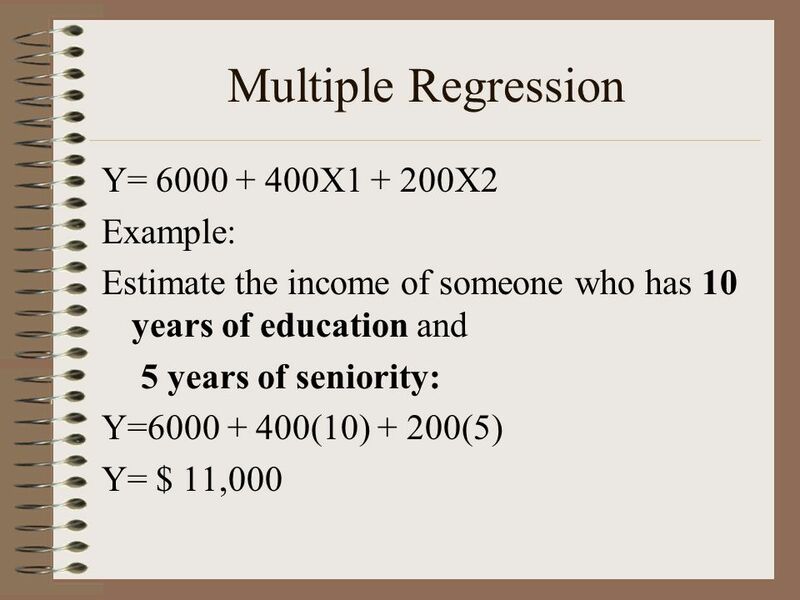 Multiple Regression Models. 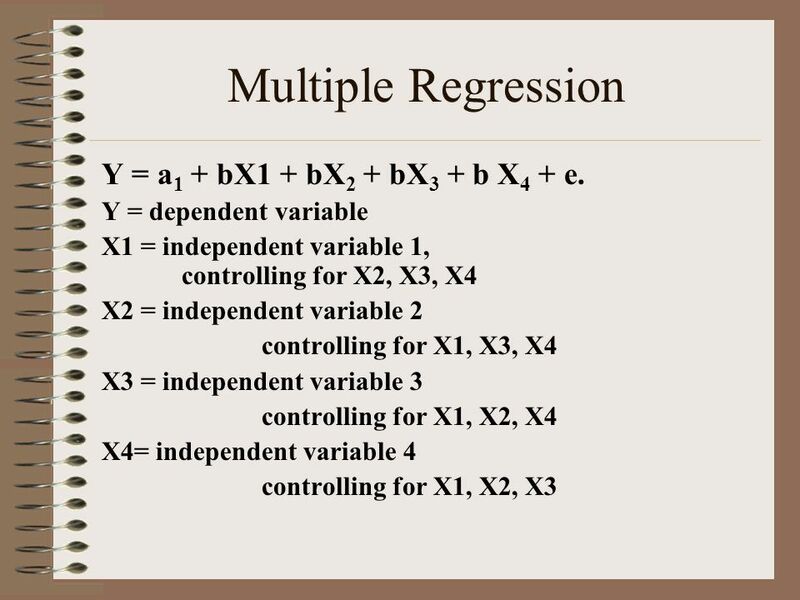 The Multiple Regression Model The relationship between one dependent & two or more independent variables is a linear function. 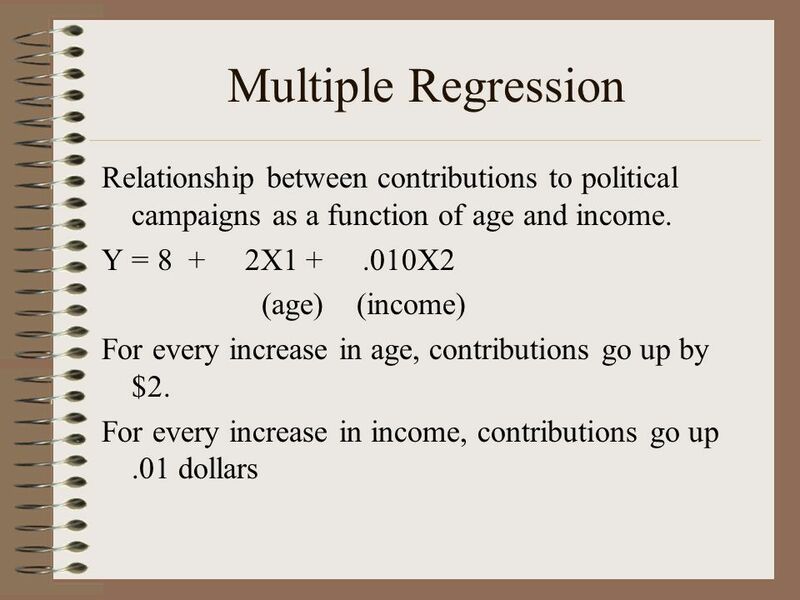 1 Multiple Regression Here we add more independent variables to the regression. 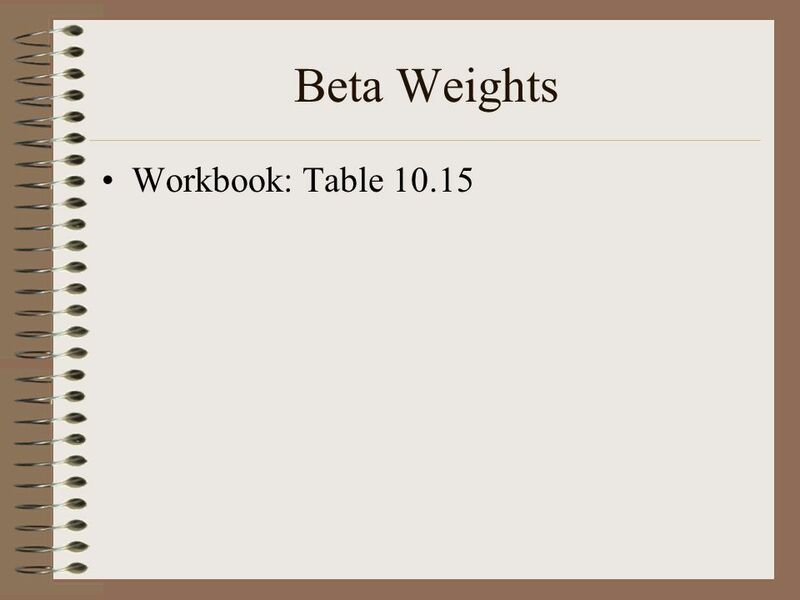 In this section I focus on sections 13.1, 13.2 and 13.4. 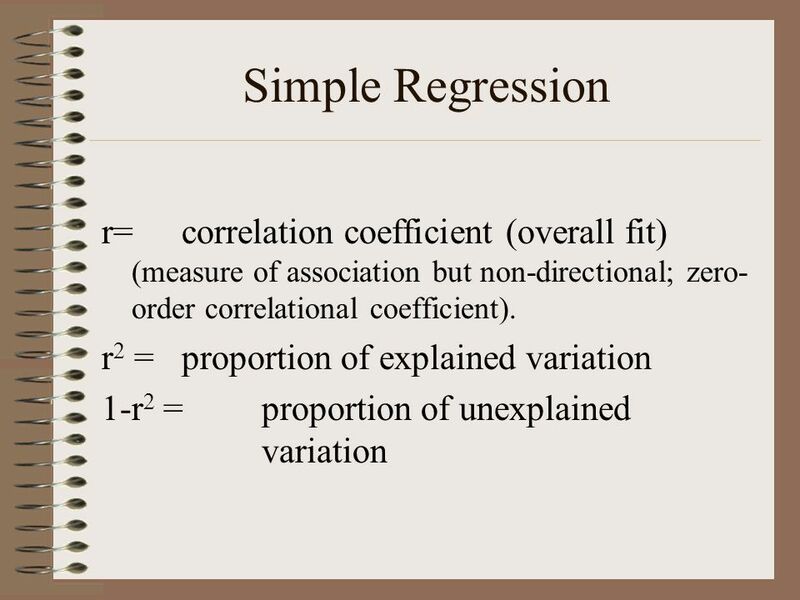 1.What is Pearson’s coefficient of correlation? 2.What proportion of the variation in SAT scores is explained by variation in class sizes? 3.What is the.